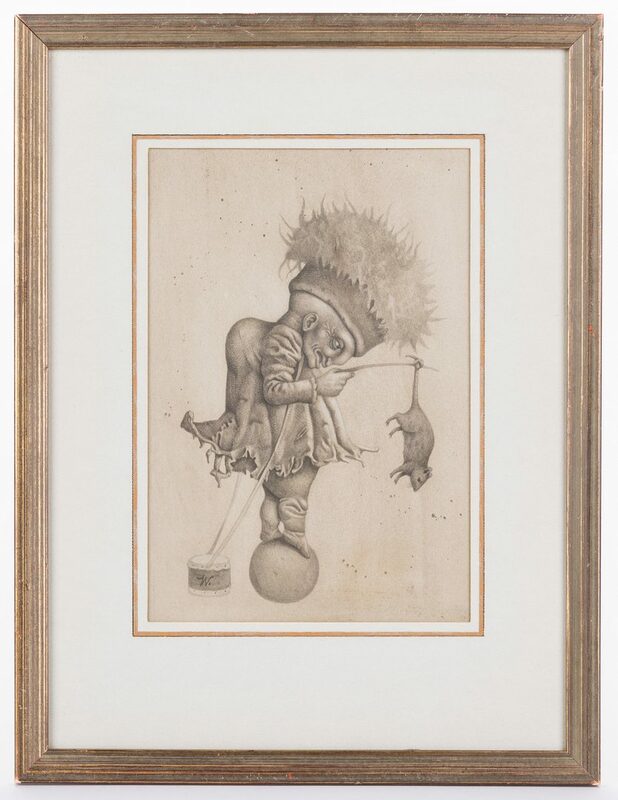 Werner Wildner (Nashville, Tennessee, 1925-2004) framed graphite and wash drawing on illustration board depicting a hunchback or troll figure perched atop a sphere and fishing a rat. 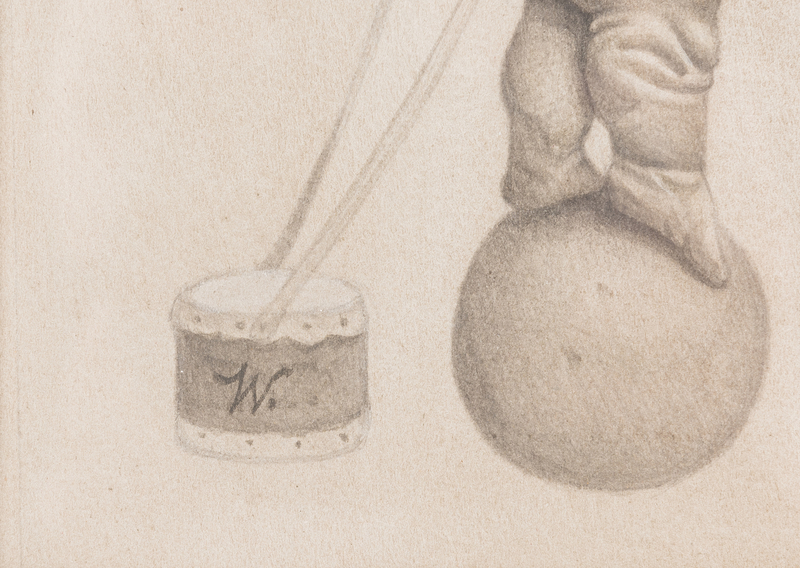 Monogram 'W" signature in the drum. 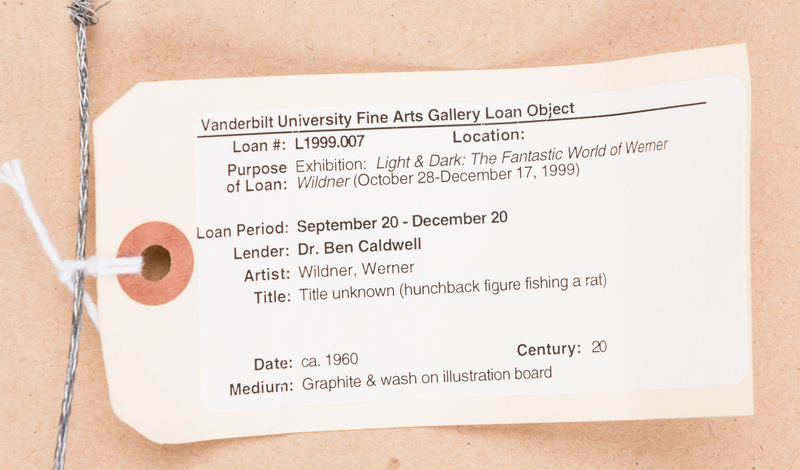 Exhibited, LIGHT AND DARK: THE FANTASTIC WORLD OF WERNER WILDNER, Oct 28-Dec. 17, 1999, Vanderbilt University Fine Arts Gallery (exhibition label en verso). Pale grey mat with gilt banding and framed under glass in a paint molded frame. Sight – 10 1/2" H x 7" W. Framed – 17" H x 13" W. Provenance: The estate of Dr. Benjamin H. Caldwell, Nashville, Tennessee. 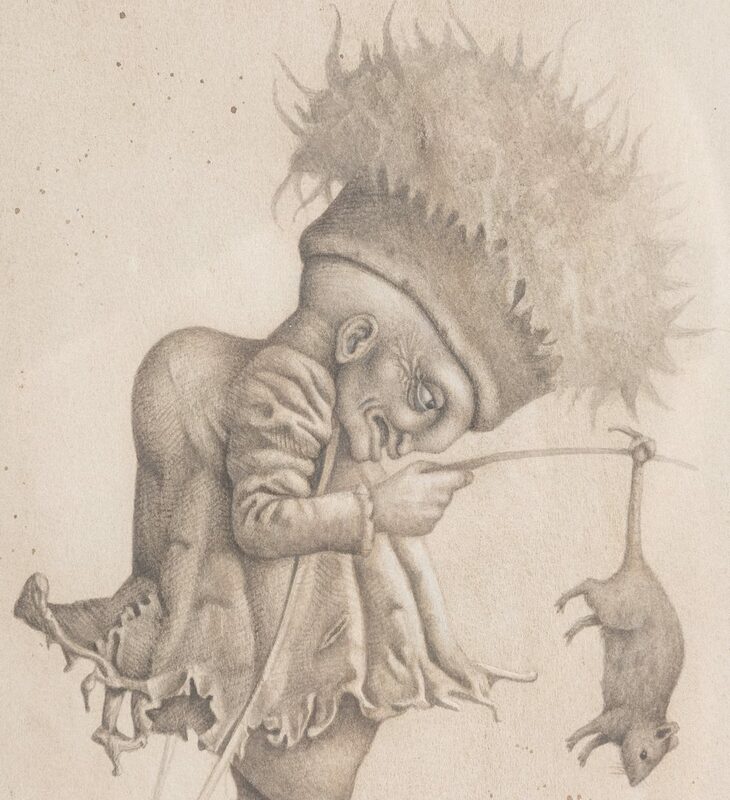 Biography (courtesy Askart: The Artists' Bluebook): Wildner was born in Germany but moved to Detroit with his family as a child and then, as a teenager, to Nashville. 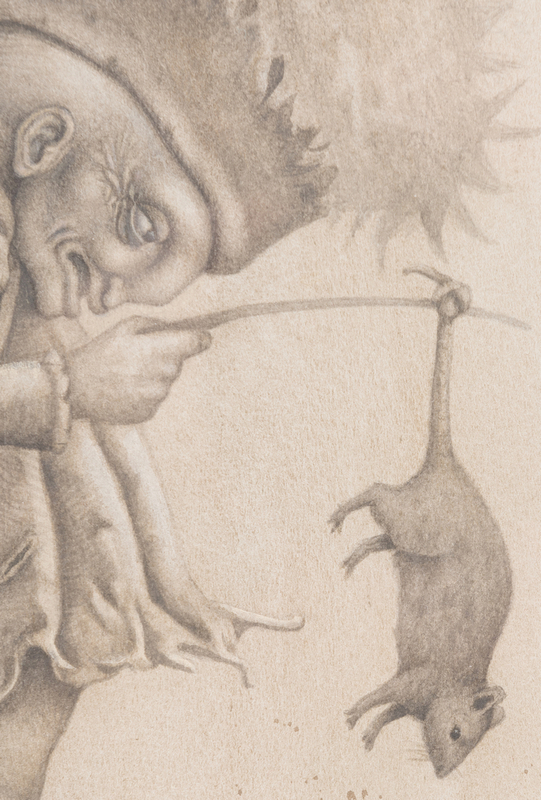 He served in the Army in 1944 and went on to study art briefly at the Meinzinger Art School in Detroit. He returned to Nashville to practice commercial art, but by the mid-1950s had decided to pursue his own art career. Whimsical animals and fantastical, often grotesque creatures were a recurring theme of his work. 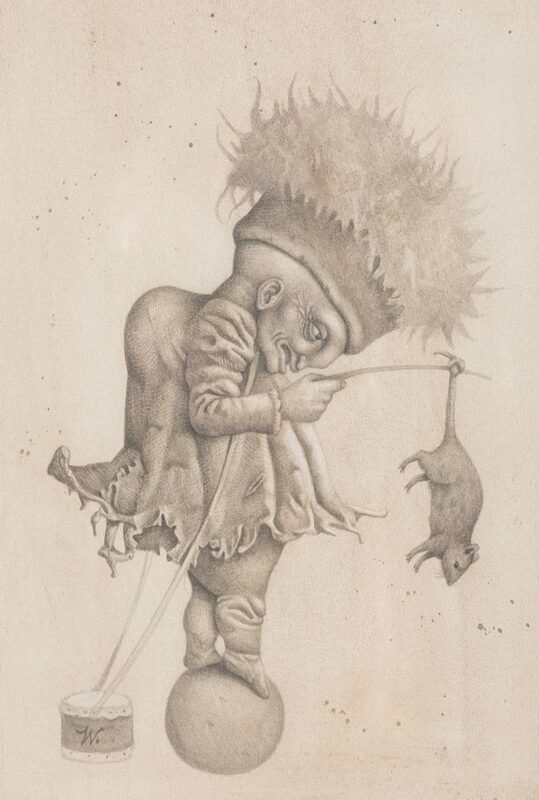 Wildner met with critical and commercial success after a 1962 exhibit of his art at the Nashville site now known as Cheekwood. However, the death of his parents and collapse of his marriage in the 1970s led him to become reclusive in the last two decades of his life. 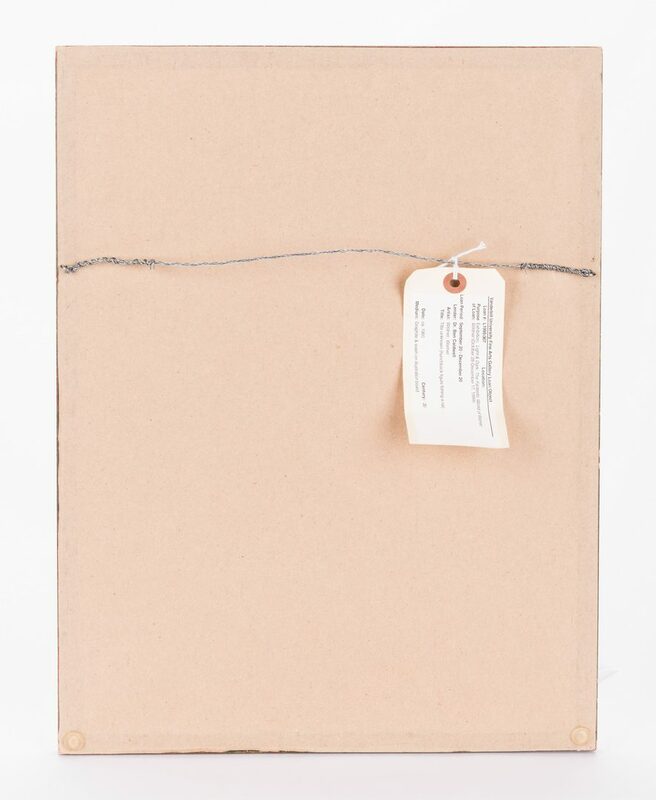 Provenance: The estate of Dr. Benjamin H. Caldwell, Nashville, Tennessee. CONDITION: Drawing very good condition with light toning. Frame with abrasions to the corner, slight separation to upper left corner.